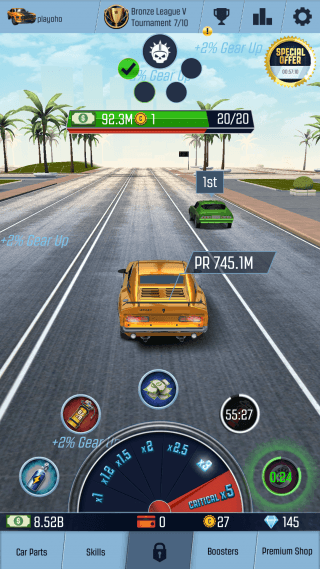 Nitro Racing Go is a fun idle driving game from T-Bull. Unlike other adrenaline-pumping racing games, Go lets you focus on increasing your car’s speed while the AI takes care of maneuvers, slip-streams and other tricks. You can tap the screen to increase its performance or upgrade its parts to get a permanent speed boost. But the fun starts when you enter boss battles, where you will have to move past a car before the timer runs out. This is where your upgrades and skills will be put to test. You must make sure you have upgrading the right parts, unlocked special bonuses, activated boosters and key skills to make sure you beat your opponents easily. These tips, hints and tricks will help you beat boss cars and improve your car’s overall performance. 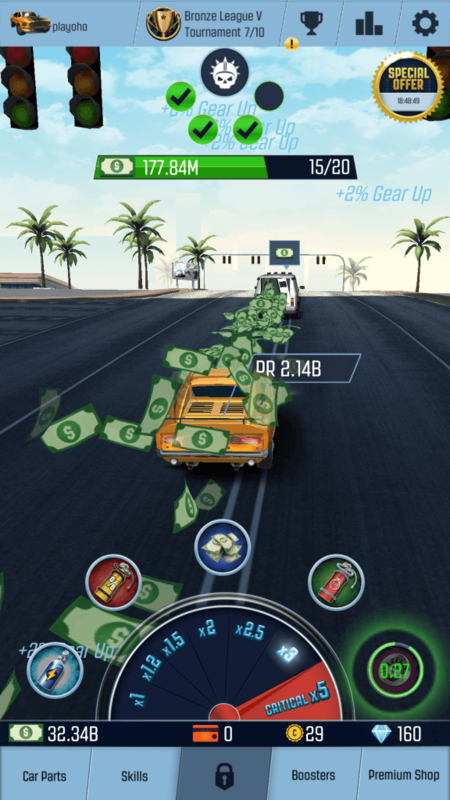 Your car’s driving performance (PR) plays a crucial role in Nitro Racing Go. You will have to increase PR to beat your rival’s racing car. The more PR your car has, the less time it will take to move ahead of other cars. A high PR car will make it easier for you to beat cars in boss battles. When you tap the screen, you temporarily boost your car’s driving performance. This constant tapping gives it a major speed boost, helping it to get ahead of other cars at a much faster rate. While this is a good way to increase performance, you should consider giving a permanent PR boost, which can be achieved if you improve its parts. The first step to boost driver performance is to upgrade car parts. There are different types of parts, such as gears, engine, steering wheel, brakes tires and rims. You will have to level them up by tapping the green button beside each part. You will notice your car’s driving performance increase a bit every time you upgrade a part. For example, upgrading “Rims” to level 5 will grant 35.4 Million PR. Parts on the bottom grant more PR, but you will have to spend more cash to upgrade them. 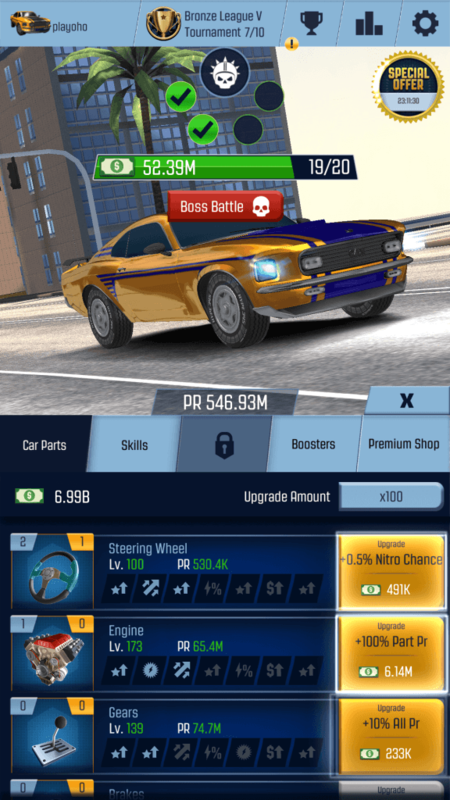 If you want your car to zoom past opponents and beat boss cars effortlessly, then you must consider upgrading newly unlocked car parts, i.e. those parts that are on the bottom of the list. They might require more cash, but this tradeoff can be extremely beneficial to get a high PR, which will definitely improve your car’s speed. What you can do is keep an eye on cash required for the next upgrade. The green upgrade button beside a part shows how much Pr you will be receiving after upgrading it. Keep playing the game until you have enough cash. When a new part unlocks, an exclamation mark will be shown on the Car Parts tab. Tap it and scroll down to unlock the new part and then upgrade it as soon as possible to reach a high driving performance. 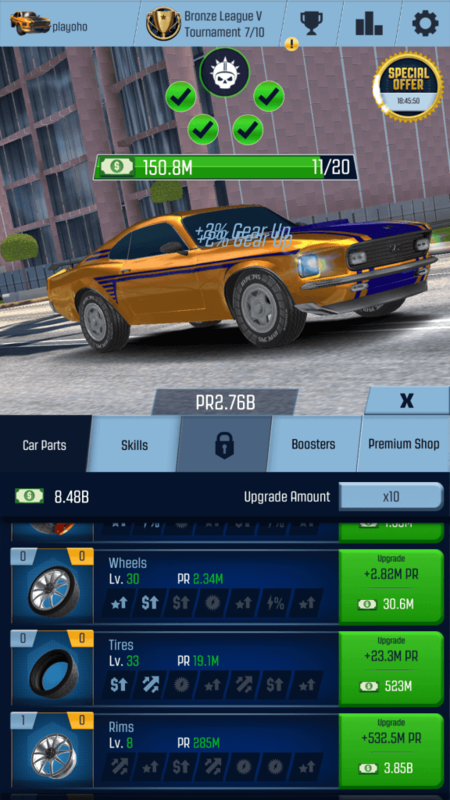 Upgrading parts not only raises your race car’s PR, but also unlocks special bonuses. You can unlock them after upgrading a part of a car to a certain level. For example, upgrading “Rims” to level 25 increases its performance by 150 percent, thereby giving a good boost to your car’s PR. You can know what bonuses each part offers before upgrading them by tapping their icons. Of all parts, you can unlock your car’s brakes’ critical nitro chance earlier and further unlock the critical nitro amount at level 50. Don’t forget to upgrade tires as you will 15 percent bonus cash when it reaches level 10. If you have enough cash and want a quicker part upgrade, then you can increase the “upgrade amount” by 10 ten times if you want to jump from level 10 to 20, 20 to 30 and so on. If you want a much faster upgrade then just tap the button beside the upgrade amount and the upgrades will jump to 100, but it will require lots of cash. Doing this, you will be able to unlock bonuses faster. Your car keeps earning money when you are not playing. When you come back again to play Nitro Racing Go, you will see a welcome screen showing how much it has earned while you were away. The game will give you an opportunity to double your cash by watching a video. The best part of this is that you will receive free collector’s coins as bonus rewards. These coins can be used to get boosters. Tapping the trophy icon on the top of the screen will take you to the achievements section where you can find a big list of tasks. Complete those to get diamonds. But wait. That’s not all. On completion of an achievement, you will receive +2% bonus PR. 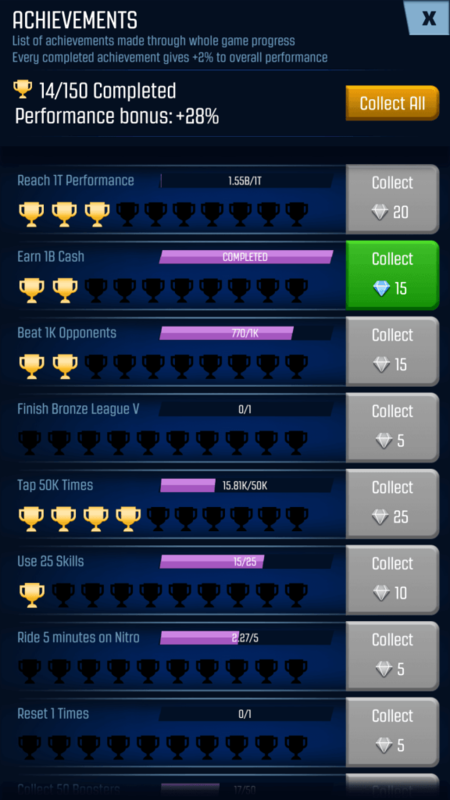 Just tap the green “Collect” button beside a completed achievement to claim your PR bonus. This will automatically raise your cars total driving performance. Skills can give a temporary boost to your car. There are 5 main skills: Super fuel, Automatic ride, Hazardous nitro, Extreme nitro and Sponsors cash. You can tap a skill (located above your dashboard) to activate it. Tapping super fuel will grant your car a huge speed boost for a few seconds. With auto ride activated, you don’t have to tap the screen for some time. Hazardous nitro raises the probability of hitting critical nitro on your car dashboard. With this skill activated, keep tapping the screen and you will notice that you will hit crit nitro more number of times than you would normally do. Activating extreme nitro will ensure that the pointer stays on the crit nitro level for a longer period of time, thereby giving a speed boost for some more time. Sponsors Cash skill grants extra cash when you activate it. Don’t forget to upgrade this and other skills to increase their effectiveness. You can use them anytime, but bear in mind each skill will be active for a few seconds and will have a cooldown time, which will vary from one skill to another. Try to use speed booster skills, such as “Super Fuel”, “Hazardous Nitro” and “Extreme Nitro” in boss battles, especially in those boss rounds where you fail to get past race car no. 1 after repeated attempts. Using skills plus upgrading parts can help you beat boss car easily. You can easily spot such vans from a distance. When you follow a cash-filled van, you will notice your cash amount on the top of your car dashboard has doubled. Just move past it and you will get double cash. Speeding past such vans is one such quick way to get lots of money for a few seconds. Another great way to get bonus money is to watch short videos to double cash for 2 straight hours of play. Just tap “Premium Shop” and tap the first button to activate this perk. Booster Packs contain part cards that can increase the performance of that particular part. You will have to collect an “X” number of cards of the same part to increase its performance. For example, if you collect 9 steering wheel cards from booster packs, you will get a performance boost of 200%. To check how many cards you have collected so far, just “Enter” the boosters album. You can trade unwanted cards with coins. Tap “Exchange” under a car set the amount and receive collector coins. You can buy booster packs with coins. You can purchase the bronze pack once you have accumulated 30 coins. Earn collector coins soon after beating cars in boss battles. You may also get them by watching short videos either by swiping the screen or when you come back after a break.